This won’t take very long. 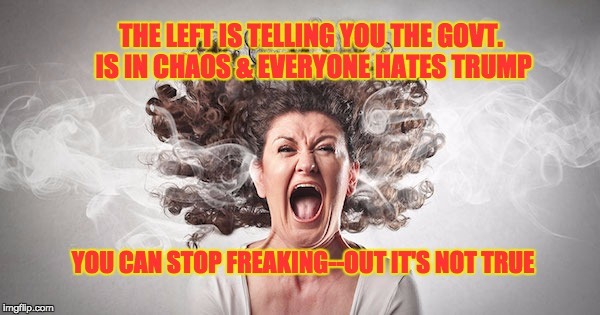 The mainstream media and the leftosphere – to the extent they are two different things – aren’t going to stop telling you everything is in chaos and everyone hates Trump. We had reservations and concerns about Obama, some of them greater than the ones about Trump, but we could get through years at a time without ever saying “Obama is horrible!” It was more important to talk about what we thought he was doing wrong. Not style, not personality, not what the media were trying to tell us he was doing, but what he was actually doing. We see Trump the same way. I just read through another column from Peggy Noonan, conveying her weekly point that everyone she runs into, in the politospace of the New York-D.C. axis, looks concussed by the earthquake of 2016. I confess, my sympathy for this ran out after week one. What does she think the rest of the country has been going through for the last eight years? Join the crowd, dear. What’s happening in America right now is the very opposite of the mainstream narrative being spun about it. The people spoke, through a due-process election. The actual law is actually being followed and enforced (minus a handful of judicial rulings). A new president is doing what he said he would do. There is resistance to these things, but that’s not because the new president is Captain Chaos; it’s because there are major factions in the country that are deeply invested in preventing change, and continuing on a course rejected by the voters. No matter what, those factions are going to keep telling us that Trump is screwing up, that he’s wigging out, that his staff is kung-fu fighting in the West Wing at night, that there’s a Russian penumbra battalion assembling in the back alley, and that Americans are so fragile and desperate that any minute now, we’re all going to surge into the streets and do something terrible. None of it is true. It’s actually amazing how much of the supposedly factual reporting turns out to be false. But if even a quarter of it were true, you wouldn’t have woken up this morning warm and safe in your bed, able to turn on the lights and take a shower. Blood would be running in the streets. You’d be able to see chaos, and not just hear someone telling you it’s out there somewhere — fleeting, spooky, like Bigfoot; like ghostly manifestations that disappear when the sane people show up, and that nobody can ever record clearly. Your neighbors would be lining up outside with torches and pitchforks. But they’re not. Go ahead, check. I’ll wait. I don’t think most folks need to be told to get unconcussed. But here’s a timely word. The “narrative” you’re hearing from the news and entertainment media isn’t going to change. No matter how little of it ever comes true, no matter how little comes of their constant harping, they’re not going to give you the relief you seek. They’re not going to STOP TELLING YOU IT’S ALL JUST AWFUL. You’ll have to learn how to tune them out. So learn. America’s future doesn’t depend on all the bad reports going away. America’s future depends on YOU not being swayed by them. Notice that I haven’t gone into why the opposing factions are beating the drums the way they are. The reason is simple: it doesn’t matter. What they are doing is nutty and unreasonable, full stop. It’s what crank pseudo-news websites used to do about Obama — rumor-mongering that he was crazy, lazy, criminally out of control, wandering the White House at night scaring his own staff to death with plans for concentration camps and currency meltdowns — except now it’s not the crank websites doing it; it’s the mainstream media. Even if Trump were indeed something dreadful, the reaction the opposing factions are mounting is not reasonable for any purpose. It is irrational, irresponsible, and incendiary, in absolute terms. So stop waiting for the “news” to be more positive before you can calm down and recover your good spirits. If you’re skeptical, how about this. Try it for a week. Try not letting the Bad Narrative About Trump into your mind. Just filter it out – it’s not like you’re going to be missing anything; there’ll be more of the same next week – and see if it is really necessary to accept a constant diet of bad reports and evil rumors into your mind, where it can discolor your view of life. The real news that matters to you will still get through. You’ll know, mostly, what will actually affect you. You don’t have to change your political views on issues. But try not letting people insinuate to you that Trump has syphilis, or the Trump White House is full of Nazi psychos, or Trump is using a big catapult to lob innocent Hispanic children over the border, and see if you feel smarter and saner without the BS stream coursing through your brain. Just give it a try. The world hasn’t actually turned upside down. There are loud, insistent voices trying to tell you that it has. But America isn’t depending on those voices to stop. America is depending on you to keep your head.